Earlier this week, in an interview with SEC Country, 5-star power forward EJ Montgomery detailed his decision to commit to Kentucky. At one point, Montgomery was believed to be Durham-bound — the fifth and final piece of Duke’s lauded 2018 recruiting class. However, only two weeks after the McDonald’s All-American game — after spending time with Duke commits RJ Barrett, Tre Jones, Cameron Reddish and Zion Williamson — Montgomery picked UK. In conversations with SEC Country, Montgomery and his team — which includes his mom and high school coach (Larry Thompson) — seemed to indicate an unease with committing to Duke after the McDonald’s game. Part of their concerns dealt how the pieces would fit in Durham; would Montgomery and Williamson makes sense on the floor together? What about everyone else? What’s of a little more interest to me, though: At no point was the name Marques Bolden invoked during the published portion of this interview. That’s not just this specific interview, either. When the conversation arises about how Duke basketball will look in 2018-19, the conversation usually starts and ends with the team’s incoming freshmen. That makes sense; Duke’s rookies will power the program. However, it’s worth remembering that Marques Bolden did some really good things for the Blue Devils last season, too. Admittedly, this is a long way to bury the lede, but: With no other true rotational post players on the roster (Sorry, Vrank), Bolden will enter the 2018-19 season as one of the ACC’s most intriguing players. When Bolden did get some playing time, though, he flashed skills that should inspire some confidence in Duke fans. In only 378 minutes of action, Bolden was rather productive. He improved across the board: 61.7 percent true shooting, 15 percent total rebound rate (11 per 40 minutes) and an offensive rating of 122.6 points per 100 possessions, per KenPom. These are all great numbers, in a relatively small sample. Bolden turned the ball over less (1.7 per 40 minutes) and got the the free throw line at higher rate: 34.6 percent free throw attempt rate. There’s no secret to his efficiency on offense; the vast majority of Bolden’s touches came right at the rim (high-percentage looks) — off post-ups, slips or offensive rebounds. According to Synergy Sports, over 98 percent of Bolden’s field goal attempts in the half-court this season were around the rim or a post-up. On non-post-up attempts at the hoop, Bolden shot 65.9 percent and scored 1.42 points per possession. In terms of efficiency, this ranked 12th amongst ACC players (107 total) with at least 30 possessions. Duke’s near full-time transition to the zone defense was well-documented this season. With pick-and-roll defense a concern, the Blue Devils were content to let Bagley and Carter wall off the rim in one of the team’s amoeba-like zone looks. It worked, too! When Duke plays man-to-man defense, opponents score 0.85 points per possession (No. 166, 12th in the ACC), shoot 41 FG% (47 eFG%) — in the half-court. As a sophomore, Bolden made strides as a defender, too: He blocked 7.2 percent of opponent two-point field goal attempts while on the floor. (Three blocks per 40 minutes — up from 1.8 in 2016-17). He rebounded well (17.8 percent defensive rebound rate), and also fouled way less. As a freshman, Bolden struggled in space — reaching, grabbing at drivers — and struggled to grasp the concept of verticality at the rim. After averaging 8.3 fouls per 40 minutes as a rookie, Bolden shaved that rate in half: 4.3 per 40 minutes, according to KenPom. Bolden got done in a stance more this season, which helped him do a better job staying in front of speedy ball handlers. However, unless he gains added foot mobility, Bolden may always be a liability in pick-and-roll coverage. Bolden did, however, show better pep while defending ball screens in 2017-18; as long as he’s active, Bolden can at least get in the way. This begs the question: Which defense will Coach K and Duke trot out next season? The answer should be both. Of course, switching and ball pressure requires excellent communication and defensive know-how. Defenders have to be able to rotate on a string, talk and cover up gaps as quickly as possible. Krzyzewski is an amazing coach (hot take alert, I know), but it’s not easy to get a group to connect like that after only a few months of prep. Defenses can leave themselves susceptible to back cuts, slips and open three-point shooters. The Blue Devils should absolutely attack opponents with a man-to-man approach to defense; however, when Bolden hits the floor — as a starter or off the bench — Duke could look to shift into a zone. The move would be a bit telegraphed under this set of circumstances, but it’s certainly not a bad thing to throw multiple defensive looks at an offense. It’s not yet June, but in a few short months, we will get to watch some of this stuff will play out. On Nov. 6 in Indianapolis at the Champions Classic, Duke will take on Kentucky. This will matchup Montgomery against several other would-be teammates. 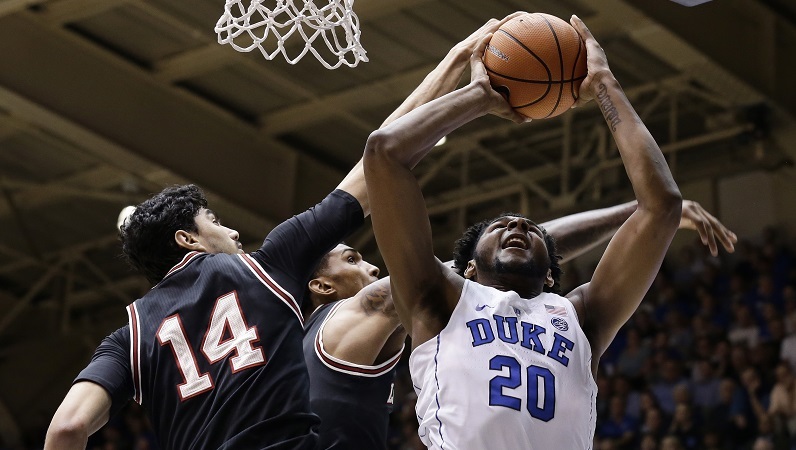 The season will be defined by what happens over the following four months, but this could also setup Marques Bolden to have a bigger role as a junior. Duke could really use his presence up front; let’s see if he can deliver.